Gin Rummy Games Glossary & More, part 3 completes rummy gamerisms. Rummy versions, like the popular gin rummy and canasta plus 10+ other variations has been covered. Also, find More Online Poker Tips: Part 2. Off Card: refers to a card neither matched nor part of a combo. Also not wanted, not helping and several other negative phrases apply here. Oklahoma Gin: game suitable for two to four players. The number of players determines the number of cards every player is dealt. 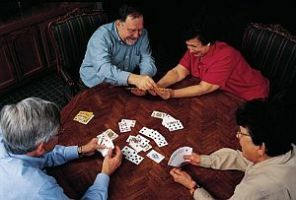 For two player games, players will receive the traditional 10-card hand, and for three to four player games; players will receive a total of seven cards. When playing Oklahoma Gin, a standard deck of cards is used and the player's goal is to be the first individual to discard all of his or her cards by creating sets and runs. Pack, Stock or Discard Pile: in Canasta and Oklahoma Gin rummy games glossary refers to the discard pile. Pinochle or 500 Rum: the main distinction with this version is that when two players are playing, each gets 13 cards, unlike the 10 cards that are dealt in standard rummy. Pot: total amount of wagers for that particular game goes to the winner. Prize Pile: in Canasta, this is a frozen discard pile. Rake: commission deducted from every pot for use of the rummy room. Rank: term for the card hierarchy and suit. Example: highest rank is a Royal, AKQJ10 of the same suit of hearts, diamonds, spades or clubs. A Royal Flush, as in 'flush with a win'. Redeal: second deal by same player after a voided initial deal. Red Three: in Canasta, the 3 of diamonds or 3 of hearts are valued at 100 points each. Reducer: term for a low card exchanged for the discard of a higher card to reduce the deadwood count in a hand. Round: single deal resulting in player out and points scored. Round The Corner: refers to the aces high or aces low rule where certain sequences that include aces have point value or not. See Aces High and Aces Low gamerisms. Run: group of three of four cards of same suit in sequence. Example: trio of 10’s or KQJ, all same suit in gin rummy games. Also known as meld. Safe Count: term for hand’s total points that if held eliminates the possibility of a win by an opposing player. Safe Discard: card that is considered something that will not be taken up to be used by another player. Sequence: describes cards of the same suit that appear in order numerically. Example: KQJ, all same suit. Set: term to describe 3+ cards that are all equal rank. Example=three 10's. Shuffle: the act of mixing all the cards properly before dealing. I say, "Mix 'em up good after that last hand." Shutout: used to define the moment when a player wins the game and the opposing players have not scored any points. This may be called a skunk. Spread: used to define a melded set. Stock or Stockpile: defines any remaining part of the standard deck after all players have been dealt their hands. Stop Card: in Canasta, a black 3 or wild card that cannot be picked up by another player from the discard pile. Suit: deck of card has four suits--clubs, hearts, diamonds and spades. Target: a predetermined number of points or hands before a game that will end the game when the target is reached. Also known as target rounds or target score. Three Hand Meld: easy definition here, a hand consisting of three melds. Top Card: refers to a card that is face down on the top of the stockpile. Trey: refers to 3 cards of the same rank. Example AAA of spades, clubs and hearts. Triplet: same as Trey, Three, Thrice or 'insert another T3 term'. Turn Up/Upcard: the topmost card of the discard pile after a deal. high cards to keep losses to a minimum should another player win the game. Upcard: the topmost card of the discard pile after a deal. Valle Cards: in the game of Pan, 3’s, 5’s and 7’s are cards that receive a special bonus. Wild Card: substitute for any other card. Jokers in Rummy and Kalooki are examples. Wild Discard: a ‘gift’ to an opposing player. While, not a strategic move to discard this value card; in rare cases, it is the correct game move. For Online Poker Tips, Part 1: 1-5, click here. 6) Picking a Position at the Table: Locate the most cautious player at the table and plan to take the seat to the left of him/her. The strategy is that these players rarely bet on weak hands. 7) Take Notes: Detail the playing styles/types of other players. Examples of questions are: Does he/she raise before the flop? What is the size of his stake? Does he/she react quickly or slowly when his/her turn comes up? A Player Notes option is available at some online poker sites. 8) Turn Off Chat: For total concentration, it is wise strategy to turn off Chat when playing online poker. 9) Turn Off Other Distractions: Chat is not the only distraction that should be avoided in the interest of increasing your bankroll. Eating, listening to music and cell phone distractions to name a few, can reduce your stack when you lose your main focus. 10) Play Tight. Use your acquired knowledge and skills by learning the rules, acknowledging the odds and betting like a shark, not a fish. Additionally, a wise strategy is to be on the lookout for quality poker tournaments, specifically with low entry fees. This is part 3 of 6, Gin Rummy Games Glossary & More Online Poker Tips.